We are an online supplier of prescription and aesthetic injectable products, but with a bit of a twist that sets us above the rest. 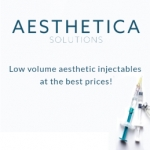 The Aesthetica Solutions team has identified and bridged a gap in the market, which enables us to provide a concept unemployed by any other prescription service. This is: the highest quality products at the most competitive prices, available in low volumes. With many years' combined experience in the pharmaceutical industry, our founders have fully integrated support, knowledge and passion within the Aesthetica team. We put our clients first – always. Our values are truly ethical and traditional when it comes to our products, which helps us to build lasting relationships that are based on trust. In addition to this, we have on-going access to product and industry innovations, which helps us to assist you, our client, in developing your business. We absolutely pride ourselves in offering a personalised, but also an expert service to you, and we are always just a phone call away if you have questions or queries of any kind.